The current exhibition in the Helvetia Art Foyer invites you to sit down: Entitled "Have a Seat", it brings together artworks on the theme of sitting and seating. Works by artists including Zilla Leutenegger, Olaf Breuning, Eva Aeppli, Kurt Fahrner, Vincent Kriste, Studer/van den Berg and Rudolf Maeglin will be on show until 24 May 2018. The Helvetia Art Foyer is open on Thursday evenings and admission is free. "Have a Seat". Dozens of people have taken up this invitation in the Helvetia Art Foyer. There they now sit, painted, photographed, stitched, modelled and projected, many on their own, others in pairs or even in groups, most of them silent. Some are posing for a portrait, others are lost in thought or immersed in a game of chess or a book. Sitting is not only a part of our cultural history, but is also one of the most important postures in our day-to-day lives. Over the centuries, seating furniture has itself become a cultural and design object. In ancient Egypt, only the Pharaohs were permitted to sit on a throne. Sitting on chairs only gradually became the norm for the general population in the 18th and 19th centuries, and the first mass-produced seating furniture came into use in the mid-19th century with Michael Thonet's coffee house chair. Under the title "Have a Seat", the exhibition in the Helvetia Art Foyer examines this theme and brings together artworks from its own collection dating from between 1915 and 2016. Works by artists including Olaf Breuning, Eva Aeppli, Kurt Fahrner, Vincent Kriste, Studer/van den Berg and Rudolf Maeglin will be displayed. Two multi-media loans from Zilla Leutenegger bring additional impetus to the selection. Every piece tells a story. 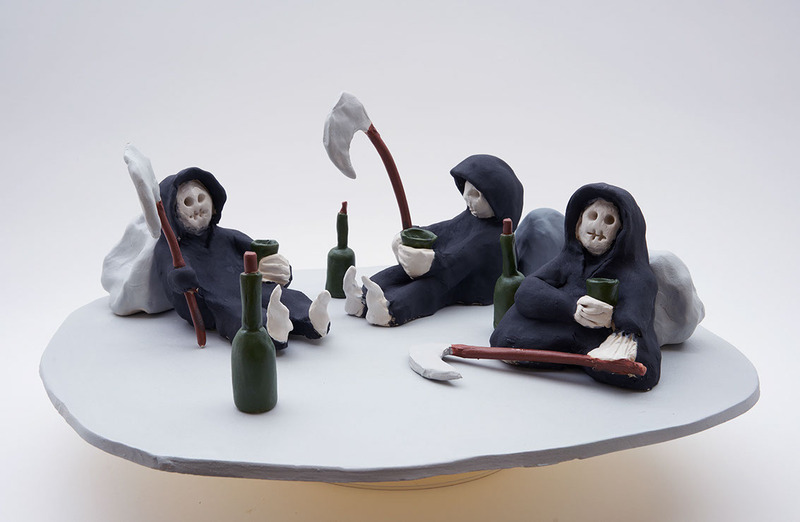 For example, Olaf Breuning's sculpture "death can wait" features three small Grim Reapers, who are obviously in no hurry to carry out their next job and have settled down for a comfortable break on their way there. In Zilla Leutenegger's video installation "rock the chair" (2011) a woman rocks back and forth on her chair and thus ends up at a dangerous tilt. She’s still holding on to the table, but how far can she lean back before the chair tips over? What programme are the two men on the red lounge sofa watching in Rudolf Maeglin's painting "On the radio" (1962)? The audience is invited to create their own stories for the pictures and objects in the exhibition. The "Have a Seat" exhibition is open every Thursday from 4 until 8 p.m. and will run until 24 May 2018. There is no admission charge. With the rotating exhibitions in the Art Foyer, Helvetia is opening up its art collection – with over 1,700 works by around 400 artists, it is one of the most significant collections of contemporary Swiss art – for a wide audience.